Holding office as war minister in the mid and at the turn of the 1920s André Maginot was one of the outstanding personalities who caused the building-up of a defensive line of bunkers, referred to as the 'Maginot Line' ,to be enacted and implemented in the early 30s. 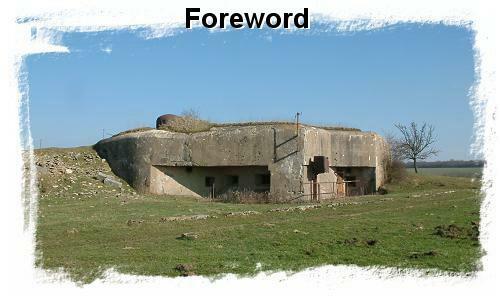 Such defensive positions were made up of somewhat odd yet attractive series of lined up bunkers, ranging from a plain interval blockhouse or fore-post to the most powerful underground fortification. Part of the bunkers have been salvaged by enthousiastic unpaid devotees, yet the greater part of them, if not out, appear as dreary, pitiful vestiges of by-gone days left over to the mercy of time and vandals. The following chapters have been thought out and written in an attempt to answer such queries as can be brought forward by day-to-day visitors, touring the network of subterranean galleries and premises of the 'ouvrage' Schoenenbourg.